ZUALLARDO, Giovanni. Devotissimo Viaggio Di Gerusalemme. Fatto, & descritto in sei libri dal Sigr. Giovanni Zuallardo, Cavaliero del Santiss Sepolcro di N.S. l'anno 1586. Aggiontovi i disegni di varii di varii luoghi di Terra Santa & altri paesi intagliati da Natale Bonifacio Dalmata. Rome: F. Zanetti & Gia Ruffinelli , 1587. First edition. Quarto (8 11/16 x 6 3/16 inches; 222 x 157 mm). , -402, pp. Text in Italian. Complete with an engraved title-page, an engraved portrait and fifty-one additional engravings of maps, plans and details of the route to Jerusalem in the text, two of which are full page. Final leaf with errata and colophon. Half 18th century vellum over marbled boards. 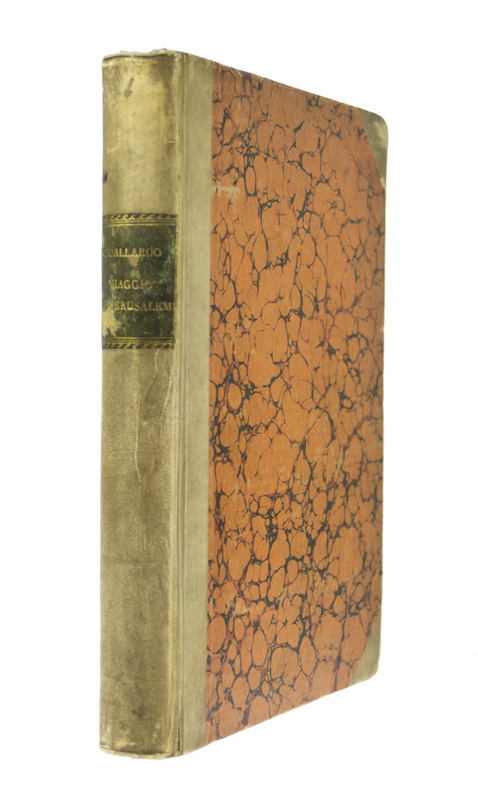 Black morocco spine label, lettered and stamped in gilt. All edges speckled black. Corners bumped and rubbed. Vellum a bit soiled. Some foxing and toning throughout. A small brown stain to the engraved title-page which bleeds through to the following three leaves. Also two tiny holes to the lower margin of the engraved title, not affecting the engraving. 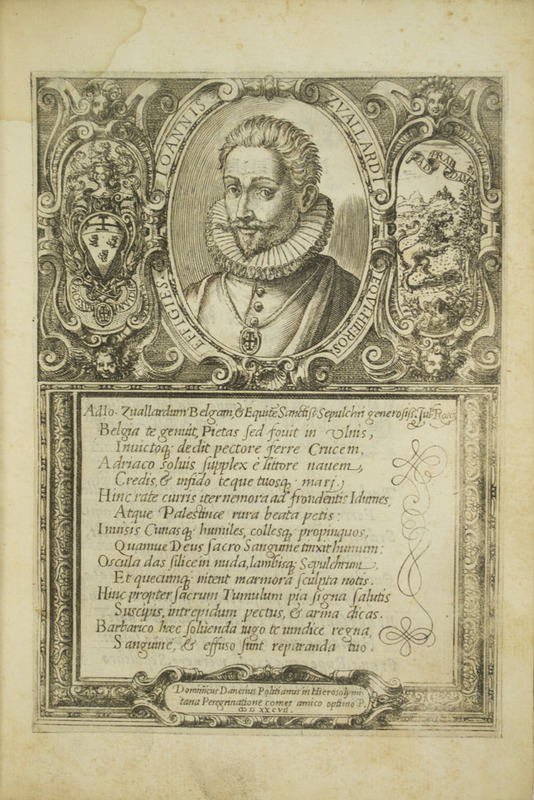 Some dampstaining (mostly marginal) that begins at the engraved title and continues on to the next several pages including the author's portrait. Overall a very good copy. 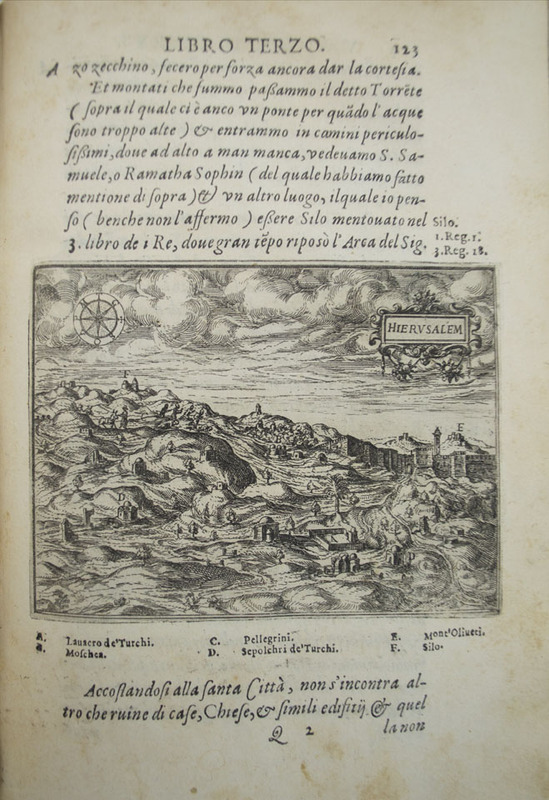 "Zuallart traveled to and around Palestine [in 1586]. 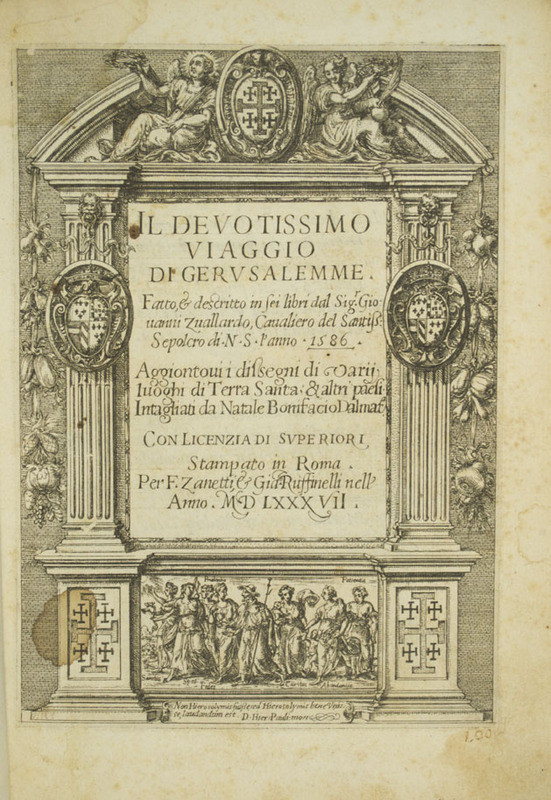 The following year (1587), his Il Devotissimo Viaggio Di Gerusalemme was printed in Rome." (The Road to Jerusalem, Noonan, pg 167). "Jean Zuallart (Giovanni Zuallardo) was a Fleming by birth; and made his journey to Jerusalem after having resided in Rome. His book was first printed several times in Italian at Rome." (Biblical Researches in Palestine, Robinson, pg 543).